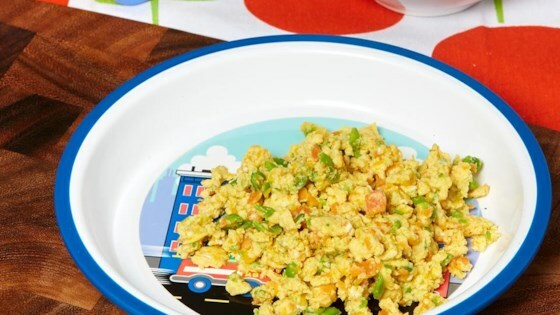 "This easy egg and veggie scramble is ultra-versatile as you can use any mashed or puréed veggies your baby loves to eat. Here, we've used a delicious and nutritious combo of puréed peas, carrots and butternut squash." Steam or boil vegetables until very tender. Drain if necessary and mash or puree together until you have your desired consistency. Let cool, then place in a sealed container in the fridge until ready to use. Whisk egg. Whisk in 1/4 cup (60 mL) of the pureed or mashed mixed vegetables until well combined. Heat a pan over medium heat. Add egg and vegetable mixture and cook, stirring often, until eggs are scrambled and completely cooked through. Remove from heat, let cool and chop into tiny pieces your baby can manage. Short on time? Instead of preparing your own vegetable purées, use a jar or squeeze pouch of your favourite baby vegetable purées instead.